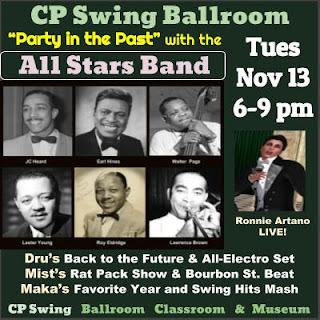 "Party in the Past" with the CP Swing All Stars Band on Tuesday, November 13, from 6 to 9pm SL. This month's party features our very own piano host, Earl Hines, leading the All Stars: JC Heard on drums, Walter Page on bass, Lester Young on sax, Roy Eldredge on trumpet and Deacon Brown on Trombone. Featuring Ronnine Artano crooning his "Rat Pack" style stage classics. Step back in time at CP Swing - the Home of Happy Feet in SL.